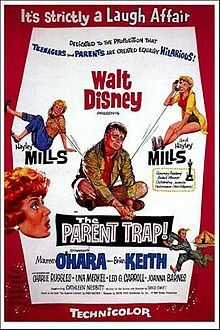 The Parent Trap is a 1961 Walt Disney Productions movie. It stars Hayley Mills, Maureen O'Hara, and Brian Keith. Mills plays twins trying to get their divorced parents together again. The movie was based on the book Lottie and Lisa (Das Doppelte Lottchen) by Erich Kästner. The movie was nominated for two Academy Awards. It was shown on television. Three television sequels were made. The original movie was remade in 1998 with Lindsay Lohan. This page was last changed on 13 December 2018, at 14:59.